March 2015 marks the 30th anniversary of the publication of one of the first and most prominent documents presenting “copyleft” idea. Richard Stallman’s publication of the “GNU Manifesto” (available here) – announcing the development of a software system which would be freely distributable and modifiable – occurred on March 1985. It has since spawned a whole new form of intellectual creations and culture. Originally propagated by the Free Software Foundation (which will also celebrate its 30th anniversary in 2015) and intended for software licensing, the idea of “sharing with your neighbours” has been extended to almost all forms of creative productions. It was undeniably one of the prominent factors in the creation of what we nowadays call “free culture”, “remix culture” or “Read / Write culture”. A nice explanation of these terms can be found in Lawrence Lessig’s book “Remix” (available here), where he employs the terminology used in the computer world. He recognizes, on one hand, “Read Only” culture, where people are only allowed to passively consume culture and where further modification and dissemination of cultural material is not encouraged. On the other hand, in “Read/Write” culture, users are also allowed to actively participate, modify and contribute to the already existing body of cultural works. “Free culture” does not mean “culture free of charge”. The adjective “free” appears as being derived from the noun “freedom”. It has therefore nothing to do with the price of the product and must be distinguished from terms such as “freeware” or “free-to-play”, which have this exact connotation. It simply means that the user of such program is free to run, modify and redistribute it. The slogan “free as in freedom, not as in free beer” is used to emphasize this. Proponents of Free Software, in fact, do not mind asking an appropriate fee for distributing software and/or for offering technical support. Explanation can be found here. Although free sharing of content might be seen as a way to foster creation, for Stallman, this was not sufficient. His intention was not only to allow others to use and modify free software without constraints – he demanded that any improvement to previously acquired free software must be shared back to the community. Thus, a license mechanism of “copyleft” was devised. A “copyleft” license allows the licensee to further modify and distribute such modified software – but only under the terms of the same “copyleft” license. This has the effect of linking the licensing terms of the original software to a new software, which is derived from it (such effect is sometimes referred to as “viral”). Nowadays, a substantial part of the open source software (OSS) is licensed under some kind of “copyleft” license (according to one of the most often cited analysis by Black Duck Software company – more than 40% of OSS comes under this license). Some other sources though indicate that this trend might receding. This includes not only software developed by communities and non-commercial entities. A number of major software vendors base their business around (primarily) free software products. Companies such as Red Hat Enterprise, Novell or Canonical all offer products and services that wouldn’t exist without the initial idea of free sharing.Beyond the realm of software, Stallman’s project had impact in areas which at first glance have nothing to do with software development, such as Hollywood films and city administration. The idea – if you distribute your modifications further, you must also make them available for others to share, use and modify – sounds simple enough, but in fact there are many inconsistencies lurking behind it. Although this concept has been put to practice a long time ago, we are still far from having a consensus on how exactly it should be interpreted. 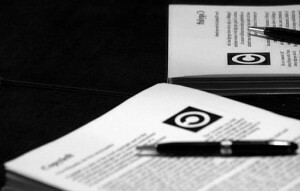 This blog series is dedicated to the commemoration of the 30 year history of “copyleft” and will focus on the discussions regarding the present implications and practices surrounding “copyleft”. The first part contains some preliminary remarks. We will later explore some aspects into details. The prelude: Why do we need/want “copyleft”? To be able to share freely, “copyleft” is not a necessary component. Copyright law offers different instruments to achieve this aim In some jurisdictions it is possible to forfeit copyright, which makes the work fall into the public domain and therefore it becomes freely usable by anyone. But more often, such full forfeiture is not possible because of certain limitations established in statutory law. In those cases it is important to allow some uses falling under the most important economic rights – such as the right to reproduce, the right to communicate to the public, the right to adapt, etc. This can be achieved by the use of so-called permissive public licenses. Translated in non-legal terms, these licenses (in most cases) allow the licensee to use the works in any way he/she considers suitable. The licensee is granted the most important economic rights – to use, to re-distribute and to modify the work. However, this cannot ensure that subsequent improvements or modifications of public domain or permissive-licensed works will also be shared back to the community. Nothing in the license terms or statutory law obliges the licensee to do so. And the practice of not doing so became widespread. This was in fact what irked Stallman so much that he decided to base his new software system on the idea of “copyleft”. (Somewhat anecdotal story of Stallman’s struggle with printer, which ultimately lead to creation of the Free Software movement, can be found in the book ‘Free as in freedom’ (available here), depicting Stallman’s path throughout the years). The rest is history – GNU / Linux project with its prominent GNU GPL license became one of the most important pieces of software and it substantially changed the world of computer programs. The problem: Where does the “copyleft” start? And where does it stop? First of all, when is a work being “distributed” further? “Copyleft” usually takes effect only when a relevant act (such as distribution, public performance, enabling other parties to make copies etc.) occurs. Part II of this blog will explore which actions of the licensee activate “copyleft” and which leave it intact. Then we will address the crucial question – what constitutes a derivative work/modification/adaptation? Not every creation which comes into “contact” with a “copyleft-ed” work will need to be licensed under the same conditions. This issue can become very technical in some instances. The dilemma will be examined in Part III. How do courts see issues connected with “copyleft”? Part IV will move away from the theoretical discussion to look at whether the idea of “copyleft” has been upheld in court decisions. The last Part V will explore what might the future hold for the “copyleft” licenses, especially with regards to emerging technologies such as cloud computing and Software as a service.